We got word from the folks that run the California State Fair's Commercial Craft Brewing Competition that FiftyFifty did pretty well. 1 Gold, 5 Silver's and 2 Bronze's. Two beers made 2nd in their categories Blonde #2 in Blonde Ale(which got a Gold...Yay! ), Drunk Monk Abbey Dubbel in the Belgian Strong Dark Ale. Imperial Eclipse took 3rd in Smoke and Wood Aged beer and Manifesto Pale Ale got an Honorable Mention. Kyle and I are quite pleased with the results considering what we're working with as well as the fact that 2 years running we've placed in very good company(much bigger breweries with long(er) histories). 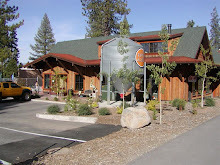 Imperial Eclipse Stout should be available at Florians in Truckee now. They got the rest of the 2008 vintage. Look for the 2009 batch to be around in December. As always thanks for your support of the pub it's always nice to hear that someone reads this stuff so thanks for speaking up!